@giacomo and I finally managed to release these long awaited features! on new installations, download updates from the Software Center before configuring the Accounts provider. Kudos to all development team! Thank you dev team ! How to send you beer(s) ? Firstly it added the ad and secondly the NetBios it picked. I did change them before SUBMIT but the result was admin@com.au. Will have a look if pre setting the required domain and workgroup in the configuration DB solves the issue. This is fresh install of NS7 with no user data imported as yet. I did not tested also the change of an existing Samba AD domain: Domain name and/or Domain IP. Just the upgrade of an existing Samba AD domain. On the NS which was installed from scratch, first i have installed OpenLDAP, after that I uninstalled it and then I have installed and configured Samba AD without issues (1. DNS Domain name; 2. NetBIOS domain name; 3. Domain Controller IP address, which must be different than the NS IP address but from the same network segment). If I understand well, you wanted to change the name of an existing AD domain but the operation failed? I did not do any of the OpenLDAP as in the previous arrangement it was either OpenLDAP or AD and not both. My target is a new system to which I will import the users and eventually their data. So the boxes coming up with .com.au and COM was not a surprise but when I entered the required values and submitted, the system ignored my entries and produced a domain .com.au with admin@com.au. The uninstall routine does seem to have reversed out the AD OK so now looking for how to get it to process the correct data. "[WARNING] configuration DB: DomainName is deprecated on ns7 and read-only! I would expect i need to edit the DomainName and then the AD will come out correct. Have I missed a step somewhere or is the code being stubborn? The following shows the confusion occurring. Some entries to the conf files are “com.au” and others are correct “domainname.com.au”. The incorrect entries are calling the configuartion db DomainName property which is read only !! OK A bit more investigation and it looks like a intended design. So how is the AD more flexible if you can not set the DNS domain name or NetBIOS name? OK solved it. Where the initial setup says domainname it actually needs hostname.domainname. If it has been done incorrectly then go to the Server Name in the server-manager and reenter it as hostname.domainname and then submit. Sorry for all the questions but could not correct it in the configuration database. I think the new Accounts Provider is great but this maybe a bugFirstly it added the ad and secondly the NetBios it picked. 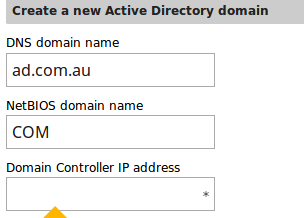 I did change them before SUBMIT but the result was admin@com.au.Will have a look if pre setting the required domain and workgroup in the configuration DB solves the issue. Sorry, but I’m a little bit confused. You want to create a Domain Controller for your organisation. for Domain Controller IP address: a free IP different than the NS IP address but from the same network segment. Now I see your last post. Good to hear that everything is OK! What about these steps ? Do you have any plan? Updated the wiki page, useful for migrations from other Samba 4 / Microsoft systems. However a multiple DC forest has some implications on the backup/restore side and cannot be trivially implemented. Giacomo has implemented the procedure, it is now in the junior-jobs list. I know @giacomo is working hard on a new OpenVPN net2net page! 17-07? Did you plan a date yet? This is great news too!